At the last pack meeting it was determined by Shukie that they needed to pursue a lead from a visiting male, Calder, about their missing Alpha Atraya who was somewhere to the north beyond their borders at a place called Mykeer. It comes with no easy task or decision to leave the WolfSpirits territory for a temporary spell in order to find their missing Alpha(s) and hopefully find out what’s happened to their usual bountiful herds that have gone missing. It’s been suggested there might be another pack responsible and whether that ties into their new visiting wolf has yet to be determined. * Shukie glanced around seeing the majority if not most everyone. They’d leave a clear trail, at least at first for any stragglers to find their way unless they elect to remain behind with no guarantees the pack would return to this territory again. A lot depended on finding Atraya and the prey that’s been long gone now. Time to find and follow the herds. With a howl, long and loud she would signal time to begin the search, leaving the WolfSpirit lands. Any that remained would be on their own. * Kwa`ani would lean into her sister, careful not to push against her other than a light touch. “Sounds like the Beta is ready to depart. You feel up to it?” Glancing around she would nod to those nearby, anxious and nervous not knowing just what to expect she did her best to look calm. * Kajika mountain ranges that flanked the Roghas. He knew he should be working his way back to the Clearing, if anything to just check in and see what their next move was, and as if almost on cue, he heard the sound of a howl from the direction of the clearing and he would freeze, turn and run back in almost a b-line, choosing to travel through pre-trodden tracks instead of making his own for the sake of speed. * Kova would have been nestled beside her sister Ayaka and Fianna when she heard the call from her sister, Shukie. She perked her ears forward before offering a low breath before howling forth to the skies as well. Just to announce her presence if anything and she would quickly rise to all fours before looking now to the others before she started off towards her sister and Beta, Shukie. * skydanZer ears perk up as she turns toward shukie and adds her own howl to her sisters before moving up beside and a little behind. “do you need me to go scout ahead?” she asks softly one ear pointing back to the rest of the group the other only somewhat toward the larger fea. * Darth would hear the beta howl, and look towards his sister, Kamaitachi; “You ready to head out?” He asked. “At least with this move, we have more wolves with us.” He said with a chuckle remembering their journey together to this land. * Ayaka rose too, giving a barking chuff in response to Shukie and Kova’s calls, shaking her pelt and nosing Fianna. They would support her, she knew the fae needn’t fear the pack would leave her if she was too slow. Wolfspirits always looked out for their own. “We will find your mother, our alphess,” she murmured encouragingly to both Kwa`ani and Fianna before trotting over to Shukie. “Beta, we have several hares and lemmings. * Darth nosed kamaitachi as they got ready to head out. “Of course, I wouldn’t have let you be alone.” He said as the final bits of the group started coming together. He looked to the north where everyone has said they’d be going and wondered what would lay ahead. * Kova she would nose Ayaka lightly before eventually reaching where Shukie was and offered a quick nuzzle beneath her chin in respect as well eagerness to head out. “I think we’re all ready” she said with a low tone before she would have found her little lemmings stash and grabbed hold of them for their trip. She came as prepared as sh ewas able. * Kajika bounded around trees that were starting the budding process of growing back with the leaves in his jaws carried as carefully as he could manage. If he did miss the group initially departing, then he could just follow their scent. If the howl was them leaving then it wouldn’t take him long to catch up at his set pace. * Kwa`ani leaned in and nuzzled Ayaka glad for the encouragement. It both helped immensely and made things worse for now with thoughts of her missing family. She dipped her head respectfully to Ayaka, “One of those little lemonythings are good enough for me” Pretty much bite sized..well, maybe two. “You want anything sissa?” knowing Fia didn’t need anything off-balancing her needlessly. She nodded to Ayaka encouraging Fia to feast as well. * Fianna turned to glance over at Shukie as the beta spoke, then looked to Kwa’ani and Ayaka and the hares she’d dropped. She nodded, bending her head to tear at one of them, until she got a quarter of it more or less, then backed off a pace to finish it off. The food would do her good, giving her a boost. Evening was well upon them, and she would need to be able to concentrate on her footing, so she didn’t trip and jar her ribs. <Calder> Had kept a keen eye on the pack as he promised to do from the shadows. He was well aware of their movements and preparations to move forward in hopefully rekindling their lost heritage. Was it even salvageable at this time? The pack certainly had the heart and soul for it, but would they be able to pass the test of patience and of time and of duty. The raw instinct to be altruistic to one another was strong with these ones. He would have to wait and see for himself. * Kajika passed through the last of the trees along the Clearing’s South border and from the top of the short hill there, he was at a point where he could catch the wind of several wolves that had been through here. And given the instructions from a few nights ago, he knew to meet up in the Ancient Forest, or at least that is where he thought that they were suppose to be meeting up. But, he would let their collective scent direct his paws as he half-ran, half-skid down the hill to catch up. * Kova would stand over the lemmings she’d captured just for this occasion and offered them freely to the traveling wolves. An ear flicked back and then forward again before she lapped her tongue about her muzzle in quiet thought. She knew the purpose of this journey and only hoped it would be as fruitful as it was led to be, but she was skeptical and rightfully so. She would dare not see her family harmed in the process and so would take up a vigilance like no other. It was time they moved to hopefully greener pastures and find the their prey before they perish. Once those who would take from her little stash where done she simply picked up two and left one behind and started to follow after Shukie. She would keep nearer to Fianna and slightly behind for she would set her pace. * Shukie nodded to Ayaka and seeing Fianna was ready, “Fianna, you and I will start out in front. Do not rush it or push yourself for that will only cause delays for you to heal enough to continue on.” her voice was soft yet stern. Looking now to Ayaka and Kova, “If you two will take post behind on opposite side in protection of our flank and make sure none fall behind that one can let me know to slow up for others.” Turning she looked to Darth and kamaitachi, “you two will pace in the middle of the pack line and keep watch to the fringes on opposite sides that would be good.” her tones were again, soft yet steady and strong. “Kwa’ani, you’ll go behind your sister in case she slips. Sky, you’ll be point once we clear the top of the passage.” she didn’t yet see Kajika but figured the male would catch up sooner or later. With that she nodded to Fianna and began to lead the wolves upon their quest. Calder was rather like elusive and kept well to the shadows, scent hidden thus far. * Kwa`ani looked up when her name was prattled on, “Yes, and thank you” the thanks for having her near her sister and for getting them underway at last. With all that Shukie said, it reminded her of her youth and the fae’s nickname of blabbermouth. She almost laughed aloud but caught herself in time. As she’d been taught, she kept her paw tracks in those of in front of her to mask her path and scent somewhat. * Darth would look to Shukie and nod his understanding; “Yes Beta!” was all he said before taking his assigned post. As the pack got ready to head out he looked to his sister and nodded his reassurance. * skydancer casts a worried look at fianna kwa’ani not to bothered by the fact as she is plenty old enough by now to know when not to push herself and patient enough to wait, a little. * Kova the missing herds have not gone unnoticed and the pack couldn’t sit idle any longer while another pack potentially took away from their bounty. At the very least they could potentially find out what was going on and solve it for the betterment of the pack. Hearing Shukie’s orders she gave a nod of her head understanding her role. * Ayaka would dip her head to Shukie, bending to grab hold of the hare’s as well, figuring to carry them until someone needed the food, nudging Kova and wagging once before dropping back to make sure all the others got underway, and keeping vigil at their tail for anything that might wish to sneak up on them. Thus far, Calder’s scent was elusive to them. * Fianna had finished licking the last of the hare’s blood from her muzzle and jerked her head up at Shukie’s instruction. She moved up alongside the fae, dipping her head. “Yes Beta.” She pushed away the worry that she was holding everyone back, and instead focused on finding Atraya, her paws beginning to hush forth – to infinity annnd beyond! As she walked, she tilted her head up to get a last look at the stars from the vantage point in which she was raised, sending a silent farewell to her homeland one last time before facing forward, focusing on making each step as graceful, and purposeful as possible. She moved as quickly as her ribs would allow without straining, mindful of both Shukie’s words, and tone. <Calder> To the north east of the hunting grounds Calder would lay in quiet wait. He had heard the rally call and prepared himself accordingly and simply waited now for the others to make their march in his direction. * Kajika moment. Gathering up his courage, he proceeded to walk into the Forest, slowly at first and with his tail between his legs. Even though he had a reason for being here, he still felt like he was trespassing. The light that still illuminated the sky didn’t seem to make it to the ground of his forest he noticed, but he started off slow but was soon enough picking up his pace to quickly find the others. The sooner he was out of the forest the better. * Shukie glanced over her shoulder to see how everyone was positioning themselves, an unseen nod of her head. “There is no hurry, little one.” she said in soft tones. “The slow pace will allow any straggles to easily find us.” She had yet to get more than a wiff of Calder’s scent, not yet having seen or questioned the brute. “It likely won’t be long and we’ll find ourselves into another’s territory or even having some big felines roaming. The bears, too, would be starting to awaken from the long winter’s sleep. 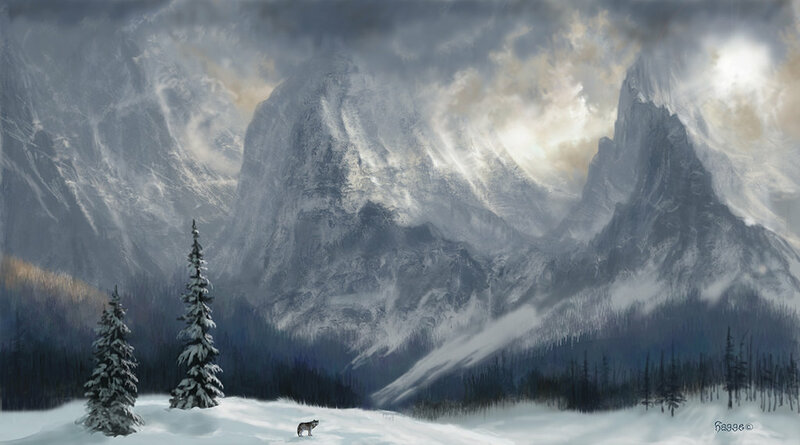 “Keep your nose to the air and your ears perked for sounds to get accustomed to what is different, what sounds the pack makes.” Their pace would see them part way up the incline leading towards the top of the pass into the northlands. * Kwa`ani caught most of what the beta had said to Fianna. As she looked over her shoulder she realized the senior wolves were in the front and the back with the others in the middle. She didn’t know why Shukie had set them in this particular order, but..well, she must know what she’s doing, or she hoped so at least. * Darth would follow in his assigned post and listen to the sounds that were offered. He would swivel his ears and keep his head on a swivel to keep an eye out for anything that may be important to bring to the betas attention. He occasionally looked to Fianna to make sure she was well, but kept to his assigned task for the most part….but kept to his assigned task for the most part. * Kova would have taken up her position as given by Shukie and didn’t move far from it. She would nose Fianna lightly in reassurance to her that all was well and, whatever pace was set was fine for the pack. She would look over her shoulder a moment to see if any others had followed behind but then looked ahead to the two new wolves Darth and kamaitachi. She saw Darth much more than the sibling and would look forward to whatever would come. “What do you think we’ll find out there Ayaka?” she asked now in passing, maybe even prying into Fianna’s own thoughts too. * skydancer pads along keeping to the tracks made by the larger wolves in front of her as they travel up the slope keeping about a lenght between her and kwa’ani so she can evade the younger wolf incase of slipping. <Calder> The marching pack would not go unnoticed and he had positioned himself in a way that he could hopefully be afforded sight to their departure. He wanted only a little longer until finally he saw the caravan of wolves begin to leave their beloved territory in the pursuit of his suggestion. A smile rarely seen upon his chiseled maw would be given for a brief moment while the words “good” whispered from his half parted muzzle. Rising to all fours he slowly began to make his way after the traveling pack ensuring that all had started to follow before pursuing. Even allowing Kajika time to catch up. * Kajika took a few steps forward and had to place the bundle down to sniff the air. There was the famililar tinge of blood in the air. It was recent, but the herbs in his jaw also hindered his ability to sniff them out and find out where they had gone exactly. So he paused in his tracks and listened out for any sounds that he might be able to hear, the tracks in the snow were few enough in number that he could almost follow them alone, but he wanted to be sure that he was following the right ones and didn’t get lost so early in their journey. Just then, the sounds of small conversation could be breaking the silence around him. The tip of his tail swayed and he set off in that direction and saw the formation of wolves walking and would make what sound he could of a chuff to them and ran straight to them at a light pace, greeting those he could with a brief brush along their shoulder in greeting. * Kova shook her head some and wrinkled her nose with the indecisiveness of what her feelings where and what her instincts told her. She did her very best to ignore them and thought the better to even move along in uncharted territories during this time of the season but they had no choice. The pack was starving and they where now missing both their Alpha’s. She would have taken a moment to stop herself and slung the two lemmings over her shoulders like a fur coat. She couldn’t well talk with those in her mouth. “I hope so too..” she said with equally as positive tones as Ayaka before she continued in thought “I do not trust him. There is no reason to… at least not yet. I don’t even know if what he’s given us is even real but we have to try. I only hope that at the end of this we find both Atraya, Faolan and hopefully Rook.” she gazed up onto the horizon as a flash of hopefulness at the later filled her hues all the while the cold nipping her lungs. “We need to be extra careful. If there’s onething this pack has shown to me is … do not go blindly into the night, do not trust anyone until they give you a reason to, and always… always follow your instinct and heart.” It was there she would hear a chuff and turn to glance over her shoulder in time to see Kajika following swiftly after. She smiled and chuffed back. * Darth continued at the pace of the pack; never really diverting from his post. He tried to keep a sharp eye out for anything. He tried to lift his nose to try to take in any scents, but wouldn’t recognize anything other than his pack mates. But his travels have always taught him that he needed to be careful. He remained diligent to the task he was assigned. * Shukie periodically glanced back watching the shadows moving. Right or wrong, finding the alphas or not, they needed food beyond rodents and slippers and hats. Glancing to her travel companion, “How’s the side, Fianna?” she was memorizing the way the fae moved to easily pick out when to take break or halt for the night. For the most part, everyone was paired up so if one was attacked someone was close enough to give warnings and aid. Believe it or not, there was at least a little method to her madness of how she staggered everyone. Again speaking to Fianna, “When you get to the top and it levels out, we’ll stop and ensure everyone has caught up. At that point she drifted back to check on the others knowing skydancer and Kwa`ani would keep eyes on Fianna and out ahead of the progression. * Kwa`ani nodded to Shukie not bothering to give a verbal response figuring quiet was better. Her nostrils exhaled puffs of white for the coldness, which was getting even brisker. Even the slightest of breezes would make it feel like -30F when it was perhaps around 0F-10F..if a wolf could tell human temps. The snows were crunchier under her paws the further up they got. * skydancer brutes make things that much safer for them all. shifting her attention back forward she spots shukie dropping back probably to check on the others trying to catch glimpses of fianna past her littermates banner proves a exersize to try the patience of a saint, in her opinion. * Kova she would continu eto move along with the others, the lemmings hanging over her frame lik ea little coat. She would let loose a low huff as they proceeded along the chosen route back towards the pack destination. She would keep her eyes focused on the horizon and as they grow in elevation she would see the familiar crest of the northern pass. She sighed with a great heevee at the thought of leaving their home temporarily. * Darth would trudge through the snow and continue the trek; trying what he can to watch out for what was going on? He would look towards kamaitachi to she how she was handling the conditions; and would look to the rest of the pack members to make sure every one was okay. * Kajika glanced at all who was present after he went around exchanging brief hellos. He looked at the way they were organized and saw that for the most part, everyone was walking beside someone. He decided to fall in behind Shukie and off to the left and would add to the lookout already on this side. He noted those who had joined in at the call and was happy to see them and what looked like a bit of food to bring along. With that and the herbs that he brought along with them, he felt well-prepared, at least for the moment. And the weather seemed to hold back any snow that might have come their way, so to him, everything so far was going smoothly! * skydancer follows the two larger wolfs in front of her until the grounds is finaly leveling of. instantly she moves out from behind kwa’ani and into the deeper snow and works her way forward head up and ears forward as she moves toward the front checking for signs of trouble as she pauses knowing that the easy stretch for her is over. the break though it may only be brief causes her pads to itch but traveling with a group simply required such action and so she takes care not to show any outward signs. * Shukie her way back to the head of the line and helped locate adequate cover from the wind.. if there was such a thing. “Sky, at first light you’ll want to scout out a bit, maybe take someone with you as well as a precaution.” She would take first watch, making an oval track around the group eventually climbing up on a small boulder nestled between a couple of tall trees. Please fill out the role play times/days that work best for you!